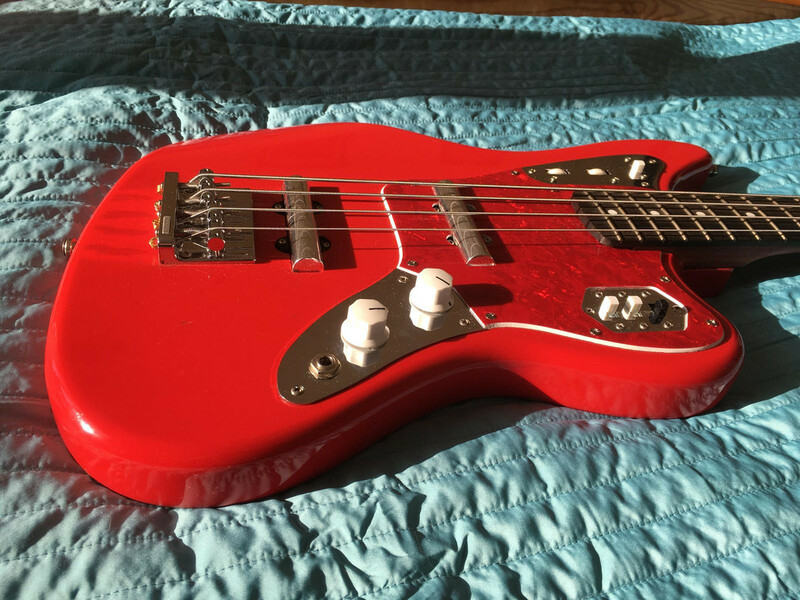 This is Japanese Fender Jaguar Hot Rod Red. 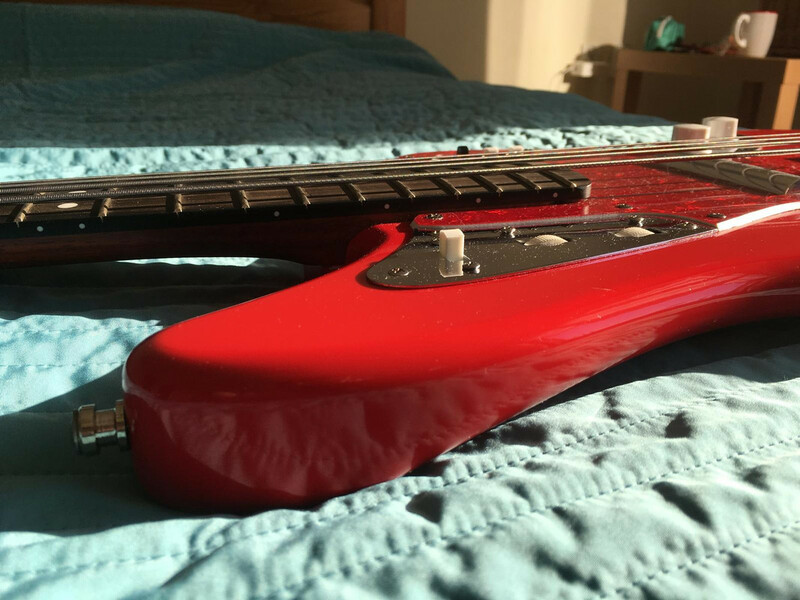 The only things left from the original bass are the body (with battery box and strap holders), 3 chrome plates (actually, I wanted to change these plates too, but that was too expensive) and one switch. Several years I was completing this project with different luthiers. It was a long and tough way. Finally it is done, this is my main instrument. 1. Neck: J Bass style Warmoth neck. Neck specification is below. I like bright sound, that's why I ordered it from padouk and ebony. Also, padouk is kinda reddish, I thought that it would look nice with the red body. Actually, it is not so red as the body, and I wanted to paint the peghead. I decided to go with mismatched headstock (this forum inspired me for this), but luthier suggested to use white veneer. The result is nice, I think. 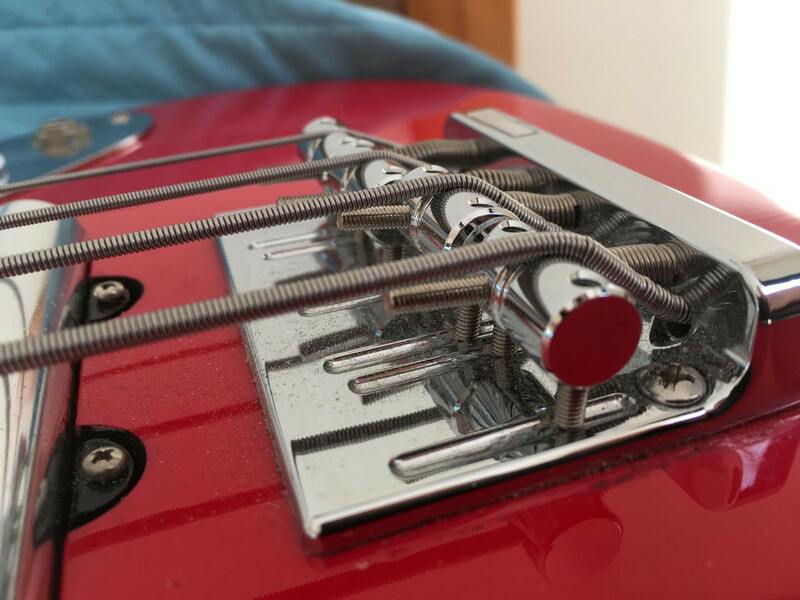 I thought that there would be no problems with Warmoth neck, but in fact it required a little bit of filing to fit, also, we had to move the bridge a bit so that the bass would intonate properly (luckily, old mounting holes were under the bridge). 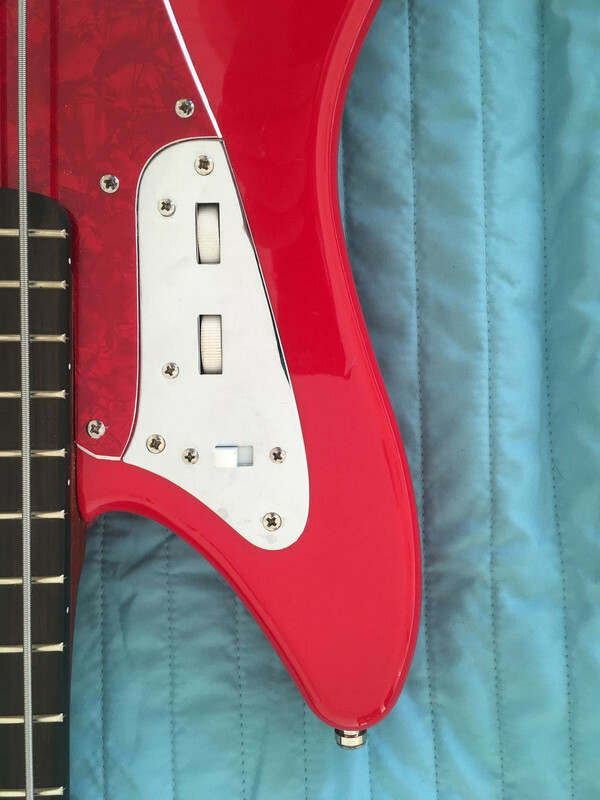 Next thing is that I wanted to have custom inlay there (Skull and crossbones), but it turned out it was not possible to make it for bass neck. They suggested me to buy a sticker, so did I. Later I decided to go with real inlay, so I made just simple white dots. 2. Preamp: EMG BTS control. Stock preamp had no true bypass, and I wanted to fix it. I found an instruction how to do this, but I was not very good in soldering and I just have broken it. Luckily, I was able to fix the passive mode, so I could still use the instrument. 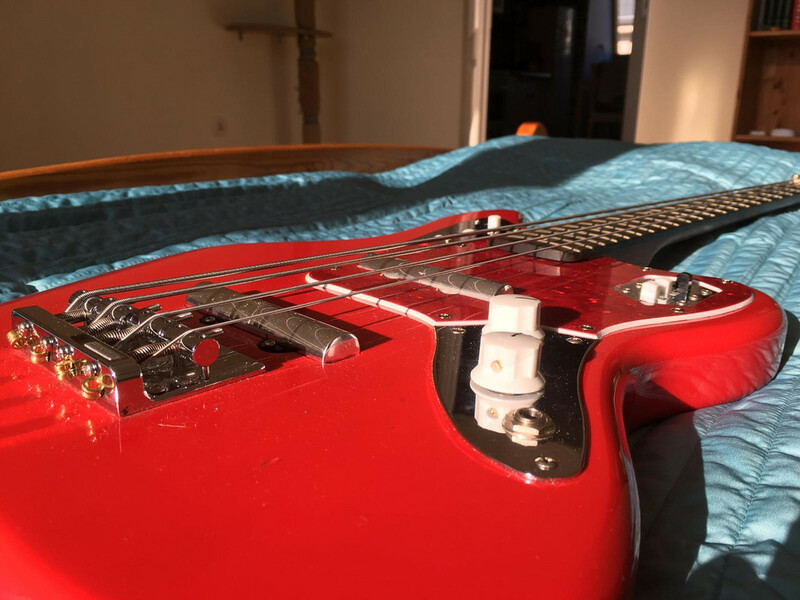 (Couple of month later I sold the neck, and the bass was disassembled for several years.) 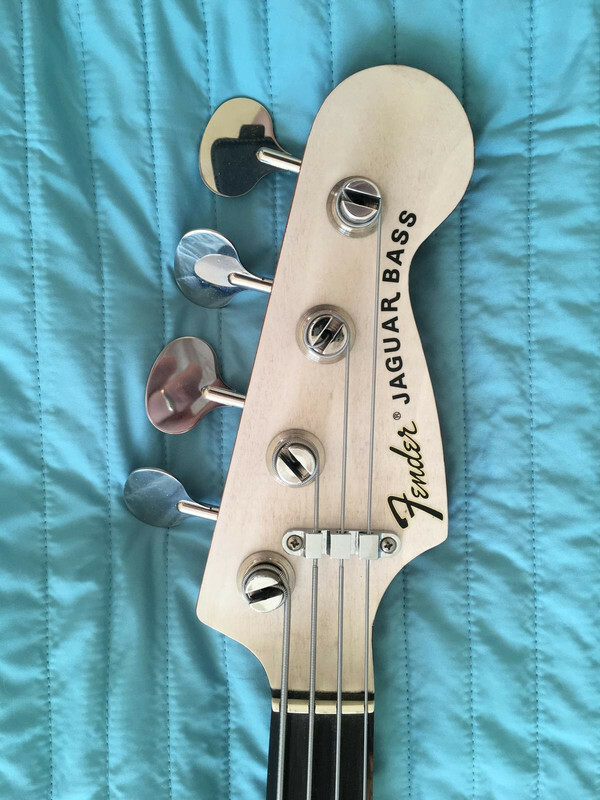 There is a nice guide(http://johnkvintageguitars.homestead.co ... -Bass.html) how to fit EMG BTS control preamp into Jaguar Bass. For this it is needed to buy additional potentiometers with center detent. I haven't used any additional capacitors. 3. Schematics. The idea is the same as in stock Jaguar, but I designed schematics from scratch. On the 3-switch plate white switches select pickups (on/off), and black one is series/parallel switch. On the preamp plate everything is the same as in stock, pots have center detent. Tone pot is not connected to anything, it exists only to fill the hole. There is only volume pot working on the jack plate. 4. 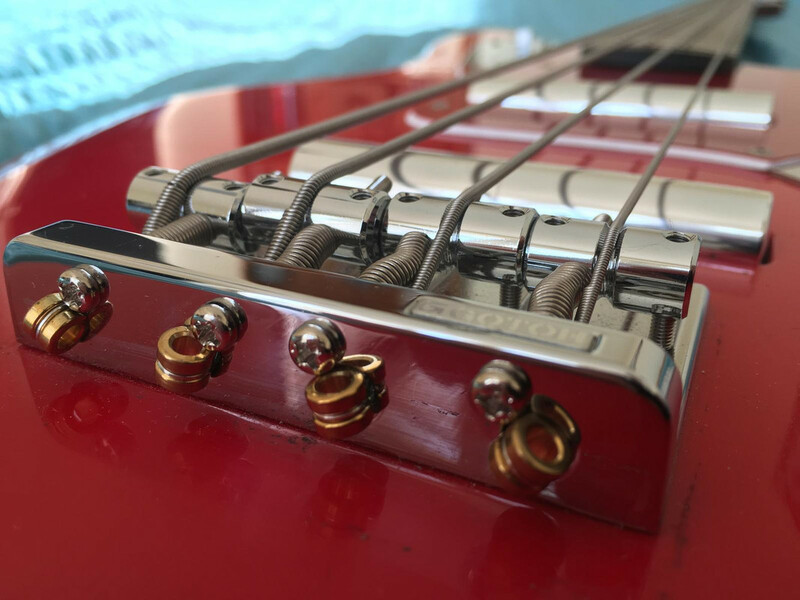 Pickups: Kent Armstrong lipstick pickups for Jazz Bass. Beautiful chrome pickups. 5. 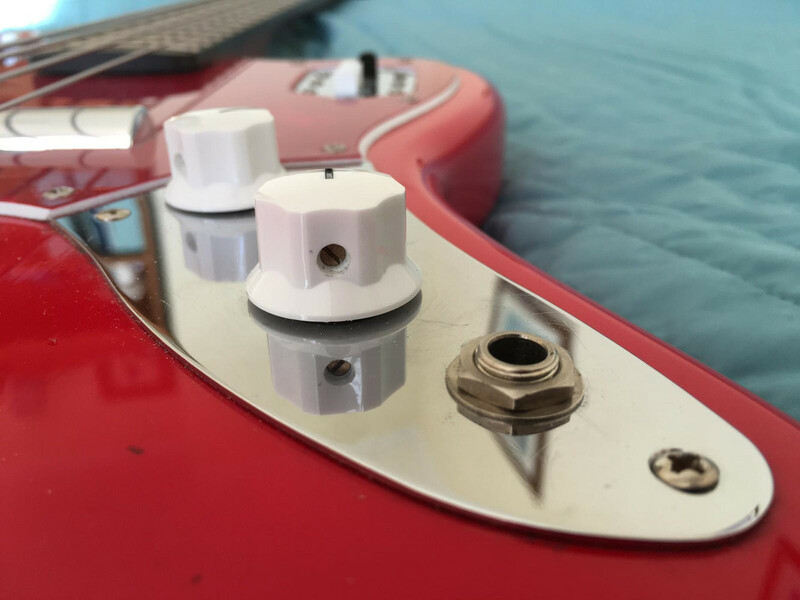 Tuners: Hipshot HB2 Bass Tuning Machines with Lollipop key. Nice shape. 6. Retainer: Hipshot 3 Bass String Retainer for 3 strings. I alway felt like retainer was required for the third string. 7. 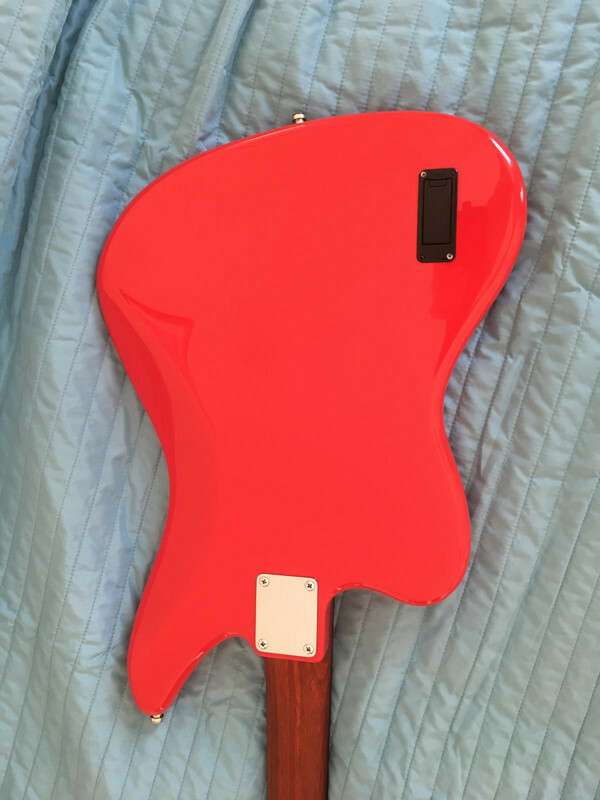 Pickguard: Red Pearl from Warmoth (ordered 10″×12″ blank stock). It is perfect color for Hot Rod Red: red pearl and white bottom. 8. 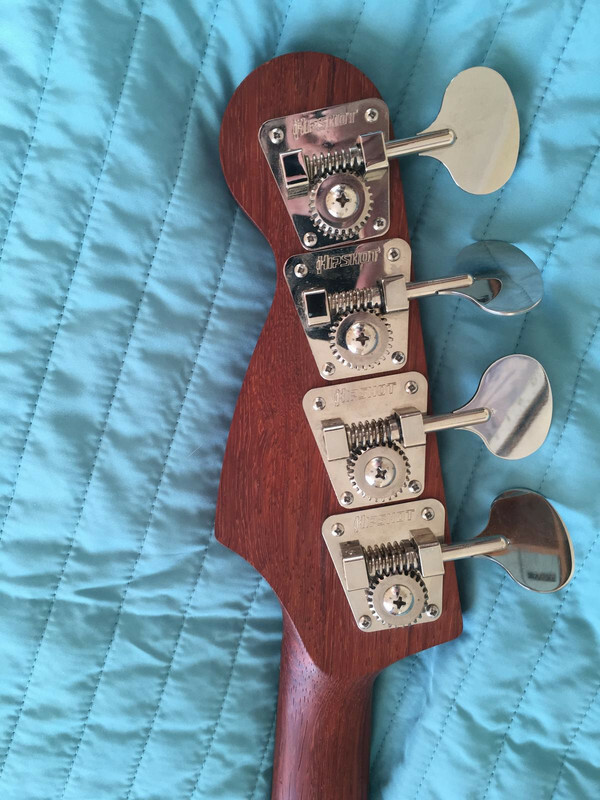 Bridge: Gotoh 201 (stock bridge was not robust enough in my opinion). 9. Switches: white switchcraft switches (the black one is original). 10. Knobs: MXR white knobs. White roller pot knobs ordered from shapeways. I also ordered red knobs, but decided to go with white ones. The funny thing that shapeways sent me wrong knobs at first and now I have additional set of knobs. 11. Volume pot: CTS 250A. 12. 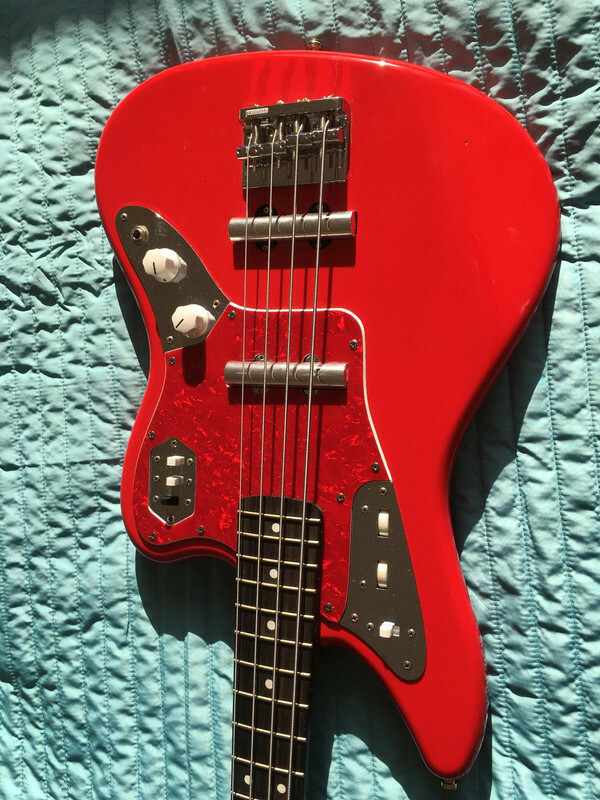 Fender Jaguar Bass decal ordered from croxguitars. 13. Strings. I like to use gauges when first two strings are thicker than on regular sets. Now I'm playing on regular E-E tuning and gauges are 50-70-85-105. Probably I will add some modification in the future. 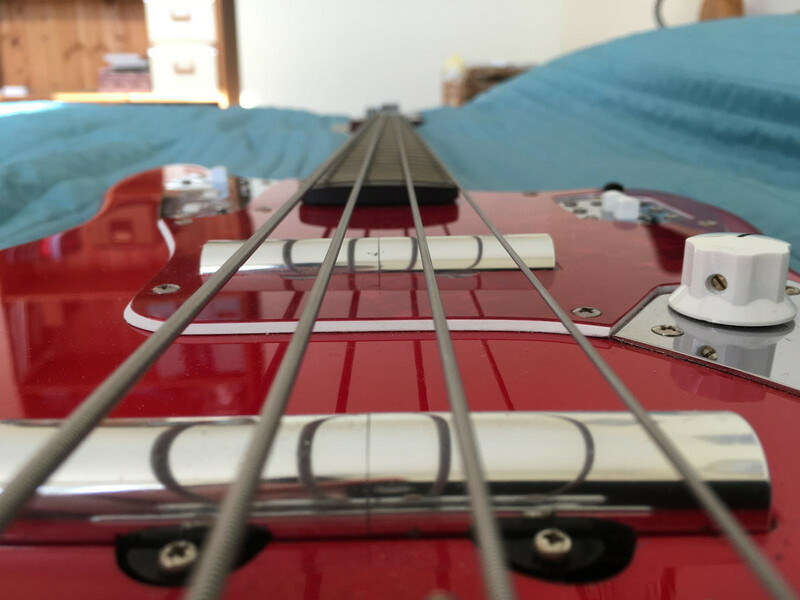 For example, I bought chrome thumb rest, but then I realized that I didn't want to drill more holes in the bass, and I was using pickups as thumb rest. I was also thinking of having some pics laser engraved on chrome parts, but for now that's it. And I'm not happy with the stock strap holders, currently strap gets out of holder time to time. Feel free to ask questions if any. Absolutely gorgeous. Really great choices with this project! This is a total ace colour combo. Nice taste, love the pickup covers!! Yes, I've got that those are actual full pickup, probably I've badly expressed my comment..
What I meant is that I just wanted to put emphasis on the fact that as opposed to the standard Jazz-bass pickup where you can see the actual cover + pole pieces, with your Kent Armstrong lipstick the first thing that has caught my eye was those "domed chromed" bars.. Thanks again for the appreciation! This project could not have happen without this forum, I've looked through many pictures here for inspiration. That’s beautiful. 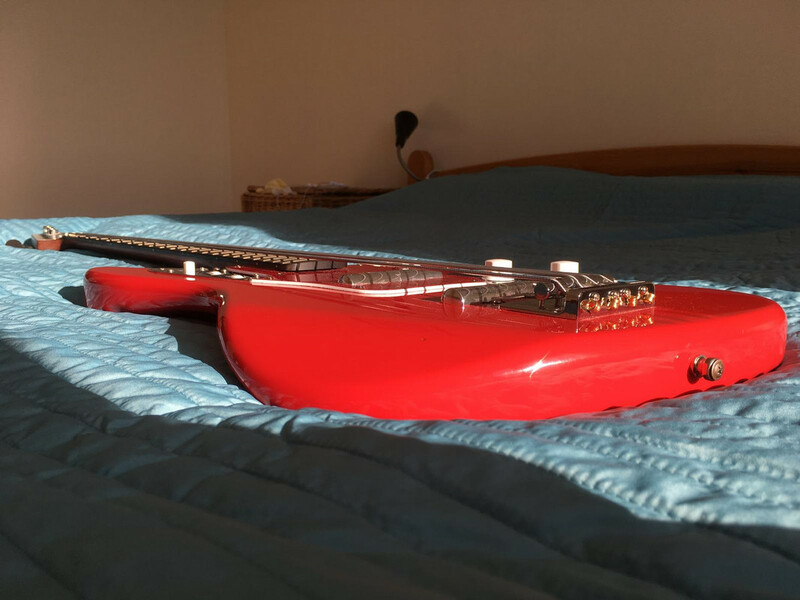 How do the pickups sound? 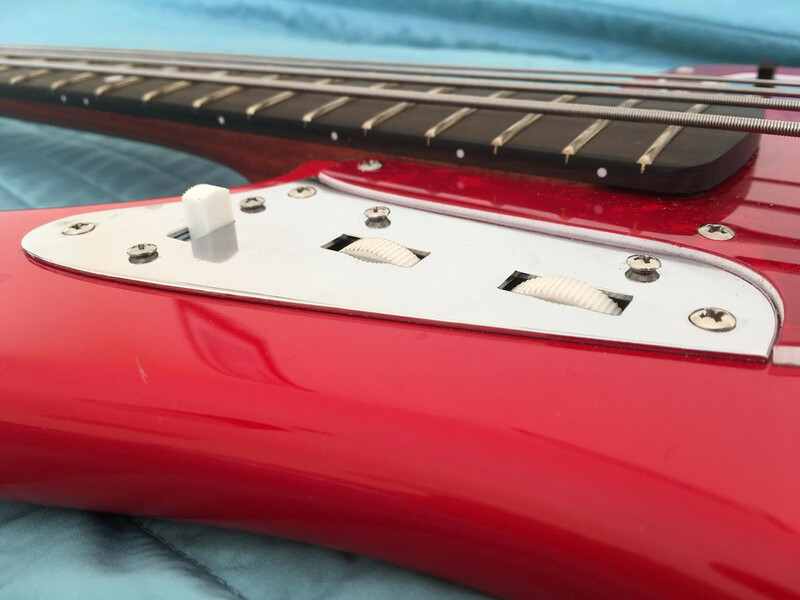 you mentioned you were looking at replacing the control plates.. i am wondering which you were looking at and if they are the same as the jag guitar control plates. thanks. nice job! Actually I had different thoughts. I was thinking to add out-of-phase for pickup (or pickups), for that I would need different chrome plates to add more switches. Later I decided to keep the same idea of switching. Ponoko has different chrome plates almost for any taste. 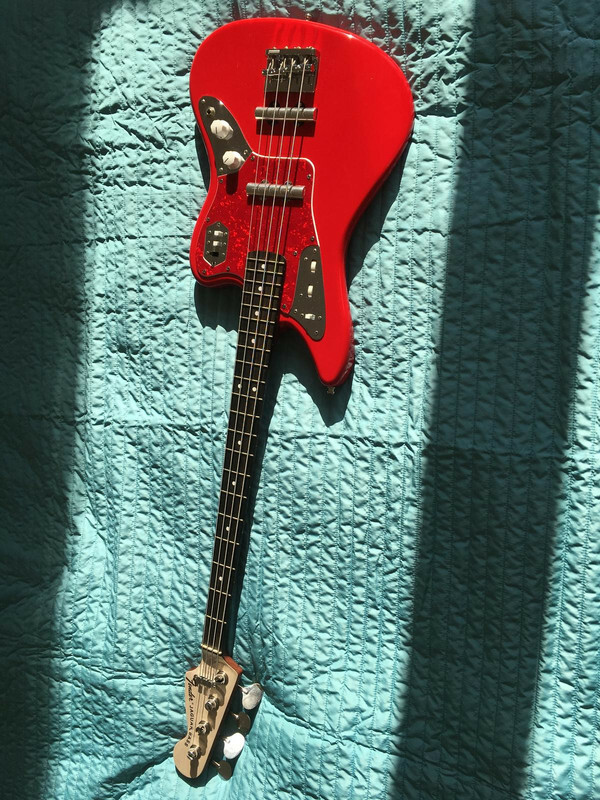 I believe (but not sure, please correct me if I'm wrong) that chrome plates for Jag guitar and bass are the same.